The Enterprise comes upon a planet that has evolved a human culture resembling Rome, except with cars and machine guns. So they beam down a few miles out of town, knowing that they have to be careful not to violate the Prime Directive themselves, and are immediately captured by slaves. At least they used to be slaves. They seem to have run away and started worshiping the sun. They call themselves "Children of the Sun." One of them is Flavius Maximus, a former gladiator. The runaway slaves are convinced that the Starfleet officers are not Romans when Kirk uses his communicator to talk to his "offshore ship." Flavius Maximus, the most flavorful of all the gladiators. While in the slaves' cave, Kirk, Spock and Bones leaf through some magazines and find that the culture is pretty much exactly like an amalgamation between Imperial Rome and 20th century America. When Kirk mentions that they're looking for Merik, the slaves say that "Merikus" is the First Citizen, and that if Kirk is a friend of Merikus, they are no friend of the Children of the Sun. However, Kirk explains that if Merikus is an important part of their society, then he's broken an important law (the Prime Directive) and he has to be taken back to face punishment. So they decide to lead Kirk and crew back to the city... and are subsequently captured by the police. Taken to a cell, Kirk demands a meeting with Merikus, claiming to be a friend. Which means if he is a friend and the guard doesn't tell Merikus, that'll get the guard in big trouble. Merikus comes along and then takes them all to Proconsul Claudius Marcus. Who happens to know everything about the Federation because Merik has been spilling beans all over the place. He tells Kirk that he has to beam down the entire Enterprise crew where they can either adapt to the Roman lifestyle or fight and die in the games. So Kirk contacts Scotty and gives him a "Condition Green" alert. This tells Scotty that they're in trouble, but he's forbidden to do anything. Now doesn't that just rustle my jimmies? 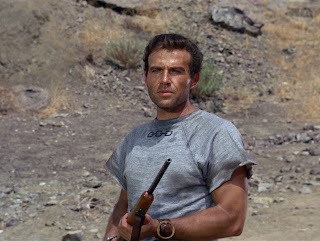 Refusing to integrate into society, Kirk is forced to watch Bones and Spock fight against two other gladiators in the arena. One of the other gladiators is their good friend, Flavius Maximus. Spock takes on the unnamed gladiator and holds his own rather well, but Bones is far out-matched with Flavius. Luckily, Flavius is a friend and tells him how to make it "look real." Eventually, however, Spock takes out his opponent and then neck-pinches Flavius. This is totally against the rules, so they stop the game and put Bones and Spock's lives in Merik's hands. Merik decides to save their life for another game. While Spock and Bones go to a cell, however, Kirk is given a nice room with a nice, hot female slu- er... slave. Kirk, however, refuses to give in to the luxuries of Rome or have the crew beam down and Claudius respects him for it. Respects, but not forgives. Kirk is scheduled to be executed in the arena. 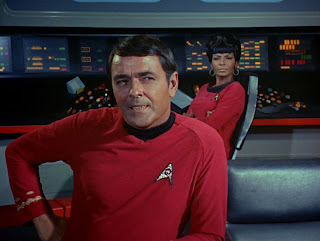 So, as Scotty picks up transmissions of Kirk being taken to the arena for killing, he disrupts the studio's power with the ship's phasers and Kirk is given the opportunity to escape. Unfortunately, Flavius dies helping him. I ROMAN GARD. I KILL GUD. Kirk finds his way to the cell where Bones and Spock are being held and attempts a rescue. Unfortunately, the guards flank them. A fight ensues while Merik and Claudius look on. Finally, Merik has a change of heart and takes out a communicator. 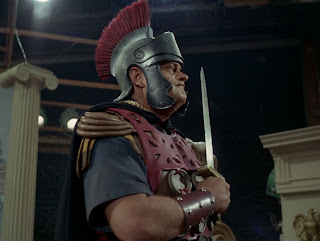 He starts to give the order to beam up the three officers, but before he can finish he's stabbed in the back by Claudius. As he falls to the floor, he throws the communicator at Kirk who locks himself, Bones and Spock back inside the cage. He gives the order to beam them up and, as the guard pull out their machine guns, they disappear back up into the ship. With Merik gone and the rest of the crew of the Beagle integrated into society, there's not much else they can do on the planet. The only thing left is to figure out why there are sun worshipers. This ancient, superstitious kind of religion was not practiced in the ancient Rome they knew and loved, so why imitate Rome perfectly except for that one area? Uhura pipes in and explains that while listening to their transmissions she's figured out that they're not worshiping the sun, rather they're worshiping the Son of God. Kirk muses that they've had a Caesar and they've had a Christ, so their societal evolution will proceed in time. As a fan of Roman times in general, this episode gives a nice glimpse into how Rome would look in modern times. They're milking the Prime Directive plot device for all they can, to be sure, but, hey, if it works, use it! You gotta remember this stuff was brand new back in these times. This also brings back the question of how Romans came to be on this planet, which I will discuss later in a post about the Preservers. Stay tuned!